Signal Conditioning Systems - Product Overview - Pacific Instruments, Inc.
Series 6100 is an automated, fully programmable transducer signal conditioning amplifier system. 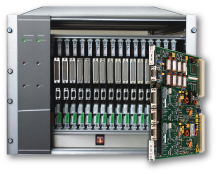 The basic mainframe holds 32 channels, expandable to 1,024 channels and is available with RS-232, IEEE-488 or Ethernet interface and software for Windows. Series 9300 is a fully programmable, modular signal conditioning amplifier system with isolated excitation, 300V common mode rejection, programmable filters and dual analog outputs. Channels are controlled from the front panel or Windows software. Plug in completion cards allow the 9300 to be used with a variety of transducer types. Model 70A is a full featured, wideband differential instrumentation amplifier which can be used for a variety of applications. Designed to amplify and filter low level signals, it can be used for line and galvanometer driving, data filtering and signal isolation ahead of an external acquisition system like the Series 6000.